For my friend's recent birthday, she organised an afternoon tea at Kensington Close Hotel. I'd never been to or even heard of this hotel before, even though it was tucked just behind High Street Kensington station. From the front, the hotel seemed very non-descript and the lobby was busy with people checking in and out. The inside of the hotel was much nicer than the exterior and nicely decorated. It had just had a little revamp, so I was told. We headed over to the bar area to where we would be sitting to have tea, and saw a few tables were already reserved for other afternoon tea-ers. When the waitress came over and presented us with a box of teas we could select from, I was extremely baffled. There was breakfast tea, earl grey, fruit teas, and tea blends. It was a box of mystery to me. Everyone else seemed to be having earl grey, so I went with the masses and opted for the same thing. If you ever meet me, never ask me to make you a cup of tea. I don't know what I'm doing. I don't know how long to leave a teabag in for, how much milk to add, basically I don't know how to make a cuppa. I didn't know how my tea should taste, so I just made up a cup of what looked like beige milk. 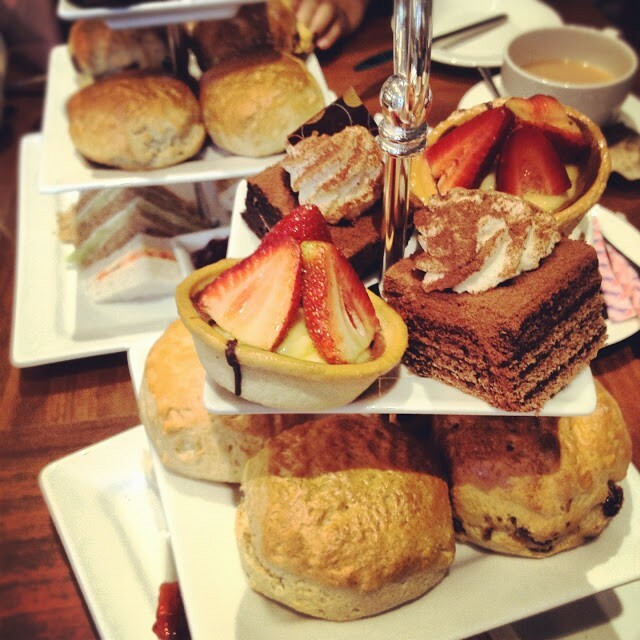 All in all, I would probably have afternoon tea again somewhere. Whether you are visiting London or live here, I would recommend it. With the Queen's Diamond Jubilee approaching you could try one of the Jubilee themed teas at the Haymarket Hotel or try the TLSee tea - Tea, London, Sightseeing - at Swissotel, where you'll find biscuits in the shape of London landmarks.